I just watched this last night and it’s a great documentary for geeks to watch. 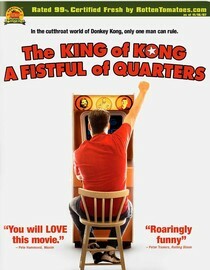 It provides a compelling story that covers the history of classic arcade gaming with a competitive spin. It tells a story behind a popular video game god and the challenges that an up and comer faces to try and take away his crown. I guarantee you will enjoy it. If you’re on Netflix this film is available for streaming here. You can also check out the movie page on IMDB here.